As much as I lament the passing of the New Beetle, its time had come. Did Volkswagen have to insult its memory, though, by immediately dusting off the old Punch Buggy game and trotting it out like a prizewinning show horse? Though the phenomenon of walloping companions in the shoulder upon sight of a Bug dates back to the sixties (according to Wikipedia, and who are we to argue?) it’s safe to say the New Beetle’s 1998 launch and subsequent lifespan introduced the game to a few new generations. Now that the car’s on its way out, logically, it’s a good time to launch a marketing campaign based on the meme, right? Well, timing’s never been VW’s strong suit. Though I’d eagerly anticipated a campaign from their new ad agency, Deutsch LA, I was left cold by the announcement of “Punch Dub,” featuring a cameo from boneheaded man-child Tracy Morgan (otherwise known as the reason I haven’t watched “30 Rock” in about two seasons). Bitching about celebrity endorsements feels like the realm of amateurs, but I’ve always strongly believed that VW deserved, and was capable of, something much greater. I’ve written editorials applauding VW’s marketing decisions, especially the excellent New Beetle “Force of Good” ads circa 2005 that celebrated the uniqueness of real Beetle owners. I think it’s awesome that for “Punch Dub,” VW found the guy who claims to have invented Punch Buggy; it shows the path hasn’t been lost completely. Let’s grant that even the best marketing teams are sometimes at a loss. Lucky for us, we can compare two pretty brunettes preening for bland-ish family vehicles. When Jill Wagner stepped up for the Milan, with her tight blue sweater and shiny hair, the Mercury brand finally had some sort of personality: until then, when had a Mercury spot ever been reposted ad nauseam? The demographic that was thrilled in the pants with that campaign later scratched their heads over Brooke Shields’ presence in Routan commercials. A lovely woman is usually a welcome addition, so what was the problem? Brooke Shields simply brought no authority to the table and thus, her endorsement seemed empty, whereas Mercury had the relative advantage of a blank slate for which any smiling face would suffice. A random celebrity doesn’t cut it for VW, not without a sense of purpose, though a celebrity appearance is not an automatic failure. Peter Stormare’s appearance in the “Unpimp” series is a notable exception to the rule because his skills were particularly suited to the ad; he was simply one of the elements of a memorable commercial. So what does Tracy Morgan bring to the table, other than his undeniable blackness? He’s made a career of milking a stereotype. He’s such a living, breathing caricature that in a “30 Rock” episode exploring the dynamics of celebrity endorsements, of all things, a cartoon rendering of Tracy Jordan needed only dreadlocks to turn into a cartoon of Whoopi Goldberg. At the risk of being crass, it’s worth noting that if “diversity” is VW’s ultimate goal, and I suspect it is, Tracy Morgan-Jordan’s entourage of “Grizz” Chapman and “Dot Com” Kevin Brown would be far superior candidates: warm, charming, overwhelmingly more intelligent and reasonably skilled in the fine art of voice modulation. 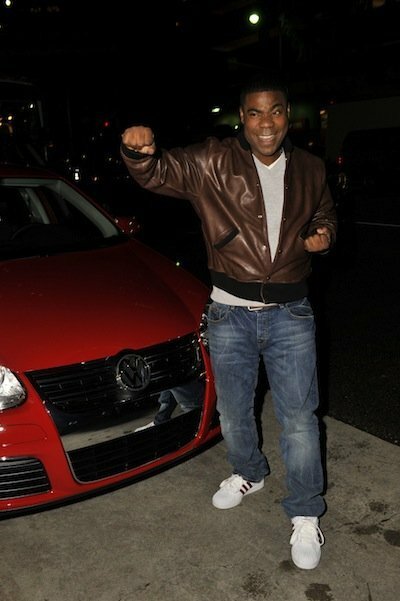 After all, if a refined, classy, wholesome pre-fall Tiger Woods couldn’t sell Buicks, what makes VW think Tracy Morgan can boost Passat numbers? And that pisses me off even more. Tracy Morgan’s never-ending one man minstrel show is actually the less disrespectful half of this equation. Remember, if you will, that the New Beetle was recently laid to rest, with commemorative Final Editions available this spring. Remember also that I pointed out the ridiculousness of designing a marketing campaign around a retired model. VW and I were in agreement on one point, at least, which is why, as far as I can discern, the iconic New Beetle will not be sharing the stage. “Punch Dub” is supposed to boost the rest of the product lineup absent any bug shapes whatsoever. Hence the name change from “Bug” to “Dub,” I guess. Plus, it sounds more “diverse” that way, don’t it? For the last few years of its life, the New Beetle was largely ignored. On the heels of its life support being disconnected, VW finally claims a meme it’s ignored for so long, and for which the New Beetle must be given at least a shred of credit, and for what? To inject some life into its current model lineup with a sad clown. VW says the ads are “designed to increase model awareness and familiarity by reminding consumers of all the Volkswagens on the road.” Well, that’s certainly a noble goal, but what could “Punch Dub” have done for the New Beetle? My warm and fuzzy feelings for Volkswagen have a bit of mileage before they’ve run out completely, fueled by my lifelong fondness for the brand if not the actual cars. That’s why I hope Tracy Morgan and “Punch Dub” aren’t a complete catastrophe. VW should hold itself to a higher standard, and that’s why I look forward to browsing the wares at the Chicago Auto Show next week, and why I hope to get a few minutes of relative privacy with one of the last New Beetles to sit in a spotlight. I have faith that the Punch Buggy will get its swan song. See you at the Chicago Auto Show.